Board index Regional Media Forums Northern Lower Michigan/Eastern U.P. Why is RDS so inconsistent? Covers all of Northern Lower Michigan (from Ludington to Tawas northward), as well as the Straits Area and Soo Region. Going through the channels on the car stereo...some stations have RDS, some don't. Some display incomplete information and some lags. What is going on? Location: Between 88 and 108 MHz. Re: Why is RDS so inconsistent? It's a very fragile signal, so it quits when the signal gets weak. It may only lock on hilltops of a weak station. Ask not what your country can do FOR you; ask what they are about to do TO YOU!! While RDS seems neat-o on the surface, I think it's kinda pointless if it's not going to work at all times. RDS is interesting....it's a lower-level signal, comparatively, to the main channel.....akin to the level of the stereo pilot, and you lose that all the time on the fringes. Broadcasters do not know, or perhaps more accurately, do not choose to employ it properly. In the north, they cry about money, but when competing with XM and streaming sources (again, see my signature box below), they don't 'get' that people want artist and title. It can be used for imaging, promos, and a lot more. It tends to cluster in areas; Detroit went wild with it when it first came out, theoretically it was because of automotive manufacturers wanting to do development on systems. Nice theory; don't know if it's true. You can, however, because of this clustering, drive for miles and never see an RDS signal. I vividly recall a group owner, years ago, when I inquired about why they were not using RDS, stated something along the lines of that being 'big city stuff' and they couldn't afford / wouldn't bother with it in the sticks.......same guy told me years later that it was the single biggest marketing and positioning tool a station can have. See, he learned! There even seems to be variances within groups. 98.1 has had RDS for quite a while now, while sister station 95.5 does not have it (and has never had it as far as I know). It depends on the settings of the RDS as far as engineering goes, and how well the signal comes in as to whether or not all the data packets can be decoded on your radio. Engineers can turn up the RDS injection level if they want, where something like 3%+ is a decent signal, meaning that if the station is somewhat weak, the RDS will still manage to come in, whereas others have the level set lower so even with a good signal, you may not get a solid RDS readout. I remember a time when WHTS here in town had their settings drastically off and the RDS would only come in about 1/2 mile from their tower and sometimes not even then. Eventually they fixed it, but it was pretty pathetic at the time. Other stations have equipment go bad and RDS goes off entirely for a period or forever (104.1 Grand Rapids recently). A lot of stations had it but ditched it in recent years, while others got it, and then others got it but aren't yet efficient with it (103.7 and 106.1 Muskegon with some of their oddities I've seen in the past). Here in town, WIIL has one of those signals where it doesn't even need to be clear, they always have RDS in. While we can get stations from Northern Michigan clearly and there is *never* RDS on almost any of them, naturally among the stations that do run it I mean, because all the hills seemingly take out that part of the signal. Terrain and other factors make a difference. The Milwaukee stations here are easy to get it, but Northern Michigan not so much. But also keep in mind the way RDS is employed these days. It's supposed to be a basic 8-character display, but stations have managed to fix it up to fit their needs by running song info and other things that extend those 8 characters by far. And that's another part of the problem is that it would be easy to get those 8 characters usually, but once you're dealing with 64, and perhaps scrolling info and whatnot, it's harder to pull all that in steadily. 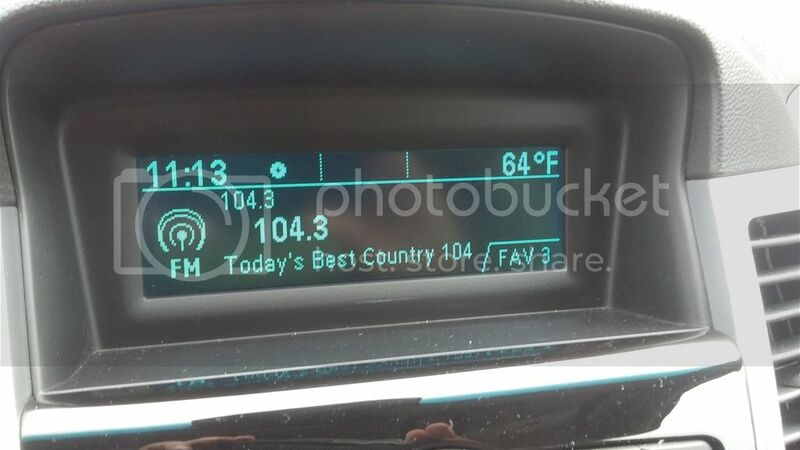 Your radio has the PS on the top line and the RT on the bottom, but seems to entirely lack the PTY. Mine (a 2004 model) has a single screen where I need to manually switch between them, but I can hold it on the PS or RT by setting it up as such so it stays on there by default and shows whatever info is coming through. 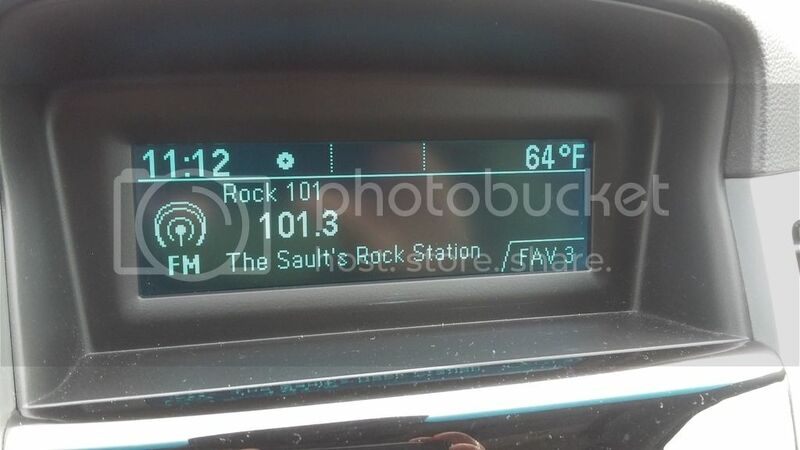 RT "The Sault's Rock Station"
PS "Today's Best Country 104.3" | "Song by Artist on Country 104.3"
RT "Today's Best Country 104.3"
The strangest RDS in my neck of the woods is that of WFBE (Nash FM) in Flint. My old 2008 Dodge Nitro would not decode that station's RDS even in Flint itself - not even the PTY (and despite the fact that my Eton Traveler decoded it just fine). Now I have a 2016 Nissan Rogue that decodes the station's RDS near-perfectly even down to around Brighton and Whitmore Lake (unfortunately it does not have PTY). Another thing I get a kick out of is when some stations don't have auto-scroll in PS on band names or other words of eight or nine characters. For example, whenever WRIF or WCSX plays a song by Aerosmith, the PS will display as "AEROSMIT" but won't auto-scroll to show the "H." WKAR-FM does this too - when displaying this afternoon's weather forecast you'll see "This Afternoo" without an auto-scroll to show the "n."
ChrisKun2K5 wrote: The strangest RDS in my neck of the woods is that of WFBE (Nash FM) in Flint. My old 2008 Dodge Nitro would not decode that station's RDS even in Flint itself - not even the PTY (and despite the fact that my Eton Traveler decoded it just fine). Now I have a 2016 Nissan Rogue that decodes the station's RDS near-perfectly even down to around Brighton and Whitmore Lake (unfortunately it does not have PTY). Actually, that auto-scroll would be the fault of your tuner instead, in most cases. All the technology is different in the end and some radios have different settings for the user as well that can allow you to view certain information. If I hold down the menu button on my car's radio, it can allow me to keep the RDS screen I want, and it can also allow me to do that without scroll it seems (I don't mess with it much as I have the setting I want), which would be much the same as what you're describing. Every great now and then though, the station does have a quirky setting. In your case, certainly your radio (I have no problem with those stations). I don't remember which station it was, whether it was up by Green Bay or Sudbury - I think the latter - but one of them behaved as you described. It refused to scroll to finish the message, no matter what I did! WFBE (their RDS from my 2016 database below) is funny here. WIIL is my local station on 95.1 but every great now and then I'll get a hit from WFBE's RDS despite the fact that their audio is nowhere to be heard. It'll change for a few seconds and then WIIL's RDS comes back in. When they do sneak their way in during morning inversions sometimes, which can be hard because WIIL is not an easy station to lose sometimes, it comes in very quickly. They obviously have a very high injection level for RDS much like WIIL does. I don't get WKAR quite that often here because I'm 7 miles from the 90.3 100kw classical flamethrower in Hesperia, but not to say it doesn't come in on a good night if Green Bay isn't in. Yeah, I've noticed that as well - when I visit family in the Lansing area, WFBE's RDS will often show up even though the station itself can hardly be heard in the slop from WMMQ. I haven't listened to Rock 105 in a while but when I did the RDS display wouldn't update. For example it would show "cartman in the morning" or something like that all day long instead of showing the song names. There is an RDS (actually it's RDBS here in the US) standards document that's over 100 pages long. I can't find it using Google search and Dogpile doesn't work here in the office. The PS is supposed to show the station ID and not scroll so it won't distract the driver in a car. The RT is for station info, comments, or anything and can scroll. There is a traffic alert feature when activated will automatically tune your receiver to the station to hear traffic reports. Some stations have had this turned on 24/7/365 such as WLGH (Lansing area), WEJC (Gladwin area), and KFDI (Wichita KS). It would be great if stations were to tie this alert feature into the Emergency Alert System. Interesting story from several years ago. My wife was in the Westwood Mall in Jackson shopping and me (not much of a mall person) stayed out in the truck listening to a tape. A storm came up and the cassette stopped playing and switched to FM 101.3. I thought it was the Grand Rapids station testing their RDS as it was around the time they started using it. Commercials came on with unfamiliar addresses and area codes. I made a few quick notes and did an internet search when I got home. It turned out to be KFDI. I emailed them and they replied they had also heard from a woman in Pennsylvania. Years later we went out to Wichita to see my wife's cousin. As we were coming in the area, the stereo would switch to the station on hilltops and would go back to tape in the valleys until we got close enough when it would stay on the station. Upon leaving the area I stopped by the station and talked with the engineer. He mentioned the person that set up the RDS was no longer at the station and the RDS manual had been lost, so they didn't know how to shut off the alert.